A QF-4 Aerial Target aircraft in manned configuration, piloted by Jim Harkins, 82nd Aerial Targets Squadron, Detachment 1, performs a flyby at Hill Air Force Base, Oct. 25, 2016. 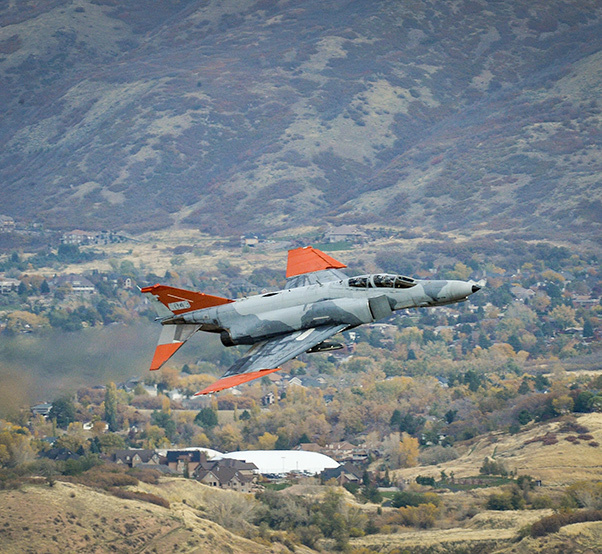 The QF-4 Aerial Target mission is winding down and two of the aircraft visited Hill Air Force Base, Utah, Oct. 25, 2016, so that those who have supported F-4 Phantom IIs over the years could see them one last time. 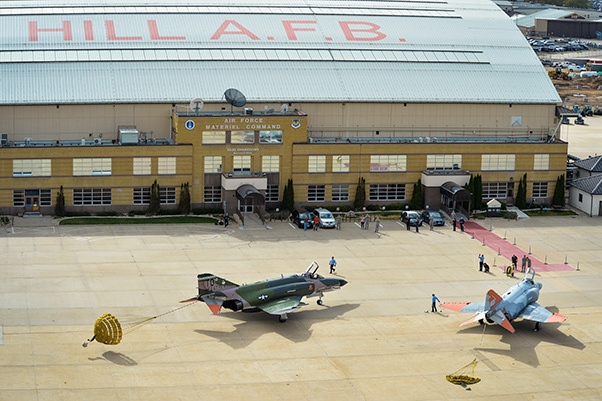 The visit–touted as the ‘Phinal Phantom Phlight’–was hosted by the Air Force Life Cycle Management Center, F/QF-4 System Program Office here. 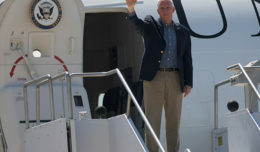 Events included a flyby, luncheon, and static display. 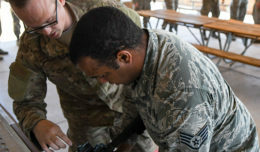 Holloman AFB, N.M., pilots Lt. Col. Ron King, 82nd Aerial Targets Squadron, Detachment 1 commander, and Jim Harkins performed two flybys, then landed here at noon and taxied toward base operations where they were greeted by Airmen and civilians. 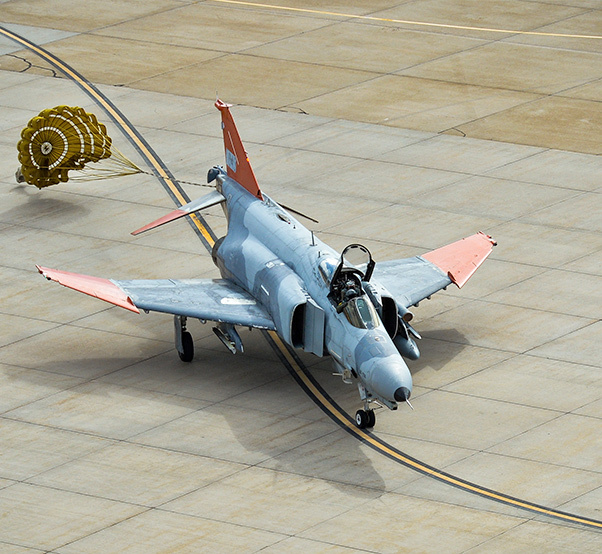 QF-4s are basic F-4s reconfigured for unmanned flight and used in Full-Scale Aerial Target missions. QF-4 Aerial Target aircraft piloted by Jim Harkins, left, and Lt. Col. Ron King, both from the 82nd Aerial Targets Squadron, Detachment 1, Holloman Air Force Base, N.M., perform a flyby Oct. 25, 2016, at Hill Air Force Base. The FSAT mission is to provide aerial targets for all Defense Department weapon systems. 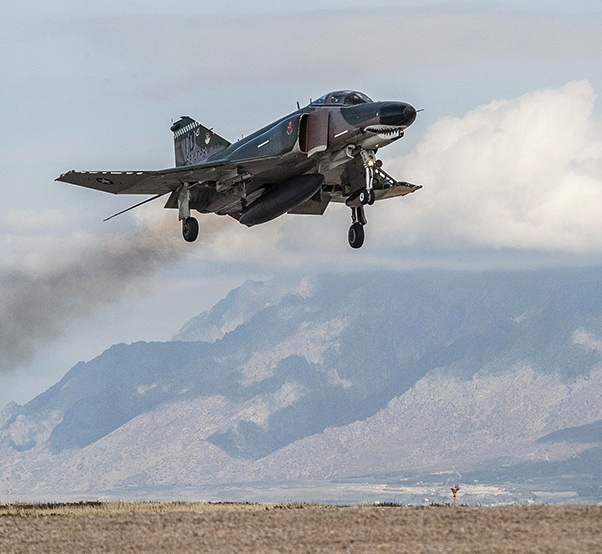 When flown in threat representative configuration, QF-4s were oftentimes shot at and destroyed during Live Fire Test & Evaluation missions and Air Combat Command’s Weapon System Evaluation Program. 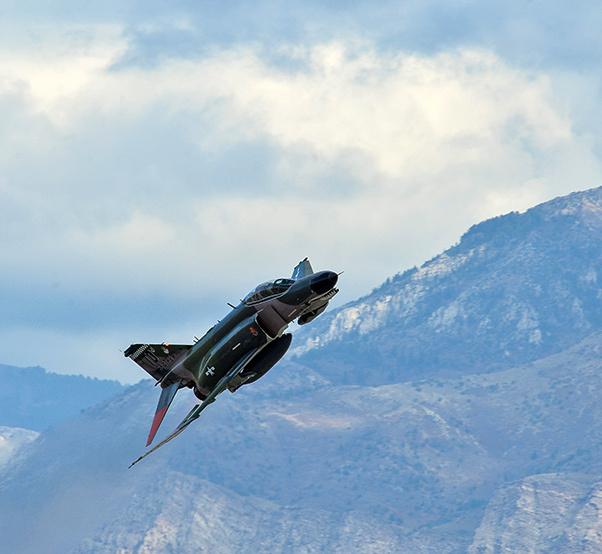 The QF-4 program, which stood up in the 1990s after the 309th Aerospace Maintenance and Regeneration Group at Davis-Monthan AFB, Ariz., began regenerating F-4s, is now in the ’Sundown’ phase of its lifecycle. 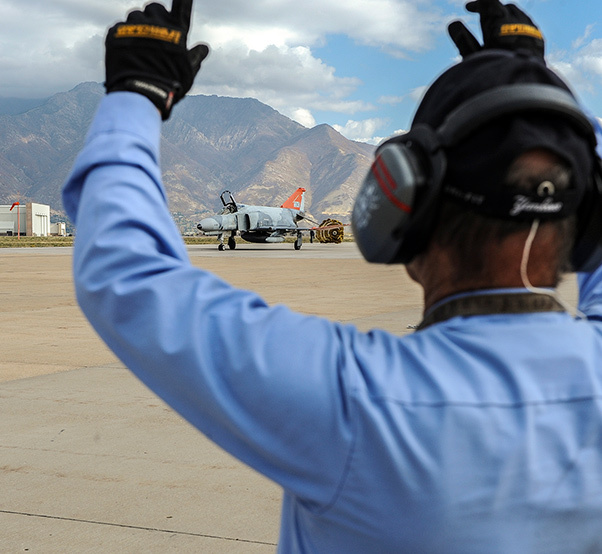 In May 2015, all remaining QF-4s were transferred to Holloman AFB for final operations. The last unmanned mission in a threat representative configuration was flown Aug. 17, 2016, and unmanned operations ended in September. The last manned QF-4 flight is planned for Dec. 21. During the program’s lifecycle, it was not unusual for these ‘unmanned’ aircraft to be flown by pilots. 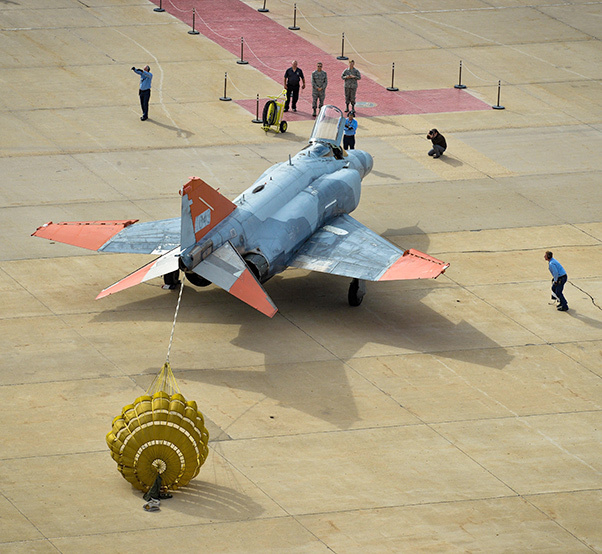 Johnson also noted that before becoming operational, each QF-4 had to be checked out with a human inside. A QF-4 Aerial Target aircraft in manned configuration, piloted by Jim Harkins, 82nd Aerial Targets Squadron, Detachment 1, Holloman Air Force Base, N.M., performs a flyby at Hill Air Force Base, Oct. 25, 2016. The end of the QF-4 mission does not mean the AFLCMC F/QF-4 System Program Office here will stand down. Besides the F/QF-4 program, the office also has System Program Management responsibility for 12 other Mission Design Series Proven Aircraft (retired U.S. Air Force aircraft acquired and operated by other agencies and countries to include NASA and 44 Foreign Military Sales customers around the world) such as the F-4, F-5, A-37, T-37, B-57, C-47, OV-10, and O-2, to name a few. The current fleet of QF-4s at Holloman AFB consists of 13 aircraft. 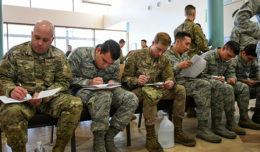 At the end of the program, those still remaining will have their engines and hazardous materials removed and be towed to the White Sands Missile Range for use as ground targets. The QF-16 will replace the QF-4. A QF-4 Aerial Target aircraft in manned configuration, piloted by Lt. Col. Ron King, 82nd Aerial Targets Squadron, Detachment 1 commander, Holloman Air Force Base, N.J., performs a flyby at Hill Air Force Base, Oct. 25, 2016. A QF-4 Aerial Target aircraft in manned configuration, piloted by Lt. Col. Ron King, 82nd Aerial Targets Squadron, Detachment 1 commander, arrives at Hill Air Force Base, Oct. 25, 2016. A QF-4 Aerial Target aircraft in manned configuration, piloted by Jim Harkins, 82nd Aerial Targets Squadron, Detachment 1, arrives at Hill Air Force Base, Oct. 25, 2016. 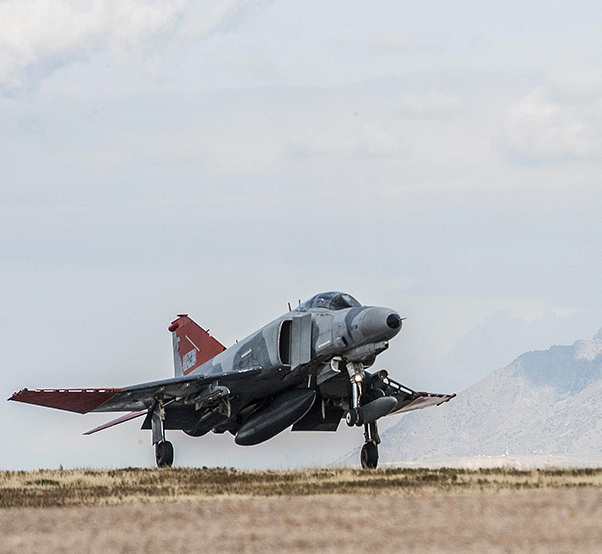 A QF-4 Aerial Target aircraft in manned configuration, piloted by Lt. Col. Ron King, 82nd Aerial Targets Squadron, Detachment 1 commander, Holloman Air Force Base, N.M., taxis after landing at Hill Air Force Base, Oct. 25, 2016. A QF-4 Aerial Target aircraft in manned configuration, piloted by Lt. Col. Ron King, 82nd Aerial Targets Squadron, Detachment 1 commander, Holloman Air Force Base, N.M., arrives at Hill Air Force Base, Oct. 25, 2016. QF-4 Aerial Target aircraft in manned configuration, piloted by Jim Harkins, left, and Lt. Col. Ron King, both pilots from the 82nd Aerial Targets Squadron, Detachment 1, Holloman Air Force Base, N.M., arrive at Hill Air Force Base, Oct. 25, 2016. Terry Spalding, 75th Operations Support Squadron, marshals a QF-4 Aerial Target aircraft piloted by Lt. Col. Ron King, 82nd Aerial Targets Squadron, Detachment 1 commander, Holloman Air Force Base, N.M., at Hill Air Force Base, Oct. 25, 2016. 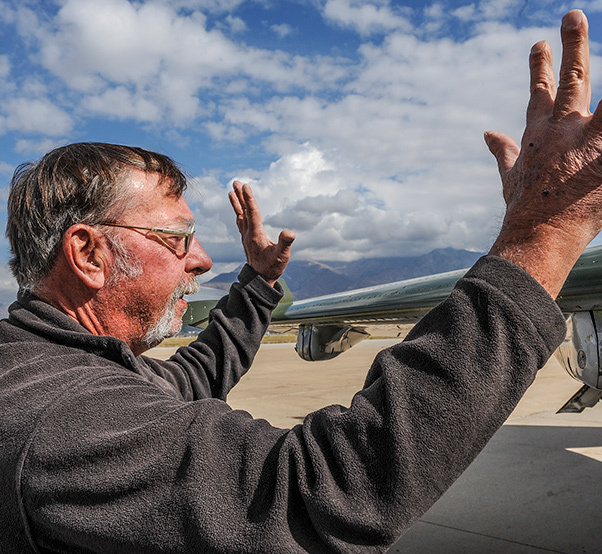 Dan Patterson, a retired Air Force master sergeant and current F-16 aircraft sheet metal mechanic with the Ogden Air Logistics Complex, reminisces about the days he worked on F-4 Phantom II aircraft beginning at 19 years of age. 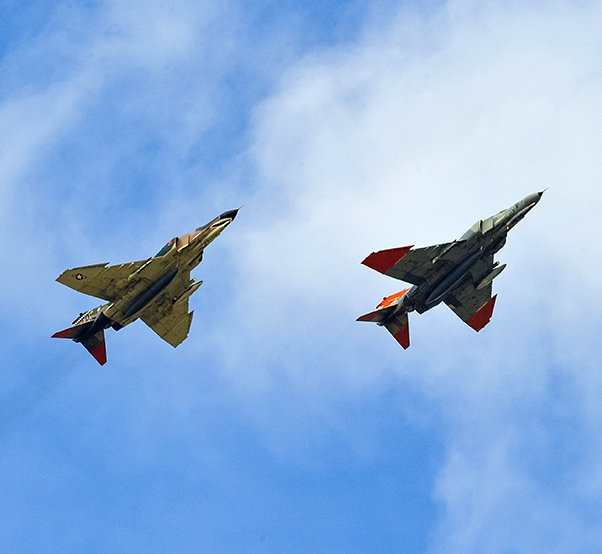 Patterson viewed two QF-4s at Hill Force Base, Oct. 25, 2016, during an event celebrating the final days of operational F-4s in the U.S. Air Force. The event — touted as the ‘Phinal Phantom Phlight’ — featured flybys, a luncheon, and static display. 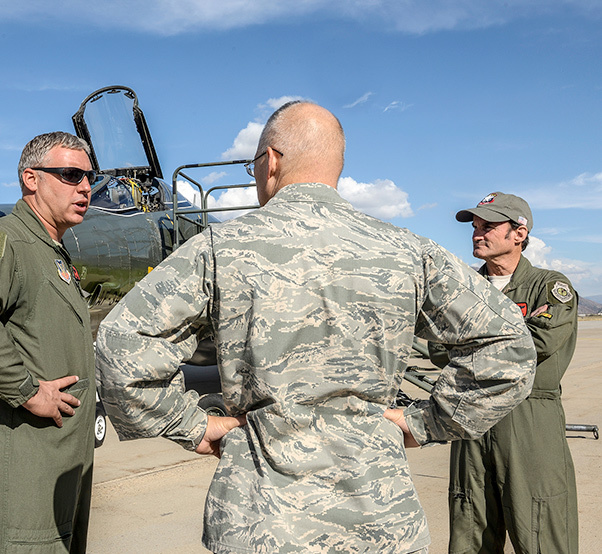 Lt. Col. Ron King, left, and Jim Harkins, both pilots from the 82nd Aerial Targets Squadron, Detachment 1, Holloman Air Force Base, N.M., talk with Col. Dana Pelletier, 75th Mission Support Group commander, during a QF-4 Aerial Target aircraft static display at Hill AFB, Oct. 25, 2016.